I’ve just arrived in Vienna and hadn’t had time to update the blog with all the catchup and management of business and trading. On this mornings bounce I sold off some upside hedges I had (1 TF future per account) and (10 2125 call hedges for SPX) and the market proceeded to sell off through most of the day making the decision look great. That said, it did end up bouncing towards the end of the day. I took the bounce as an opportunity to add some Bearish butterflies (Jul Expiration) at such a good price (If I recall, they were 10.60 for July expiration!). 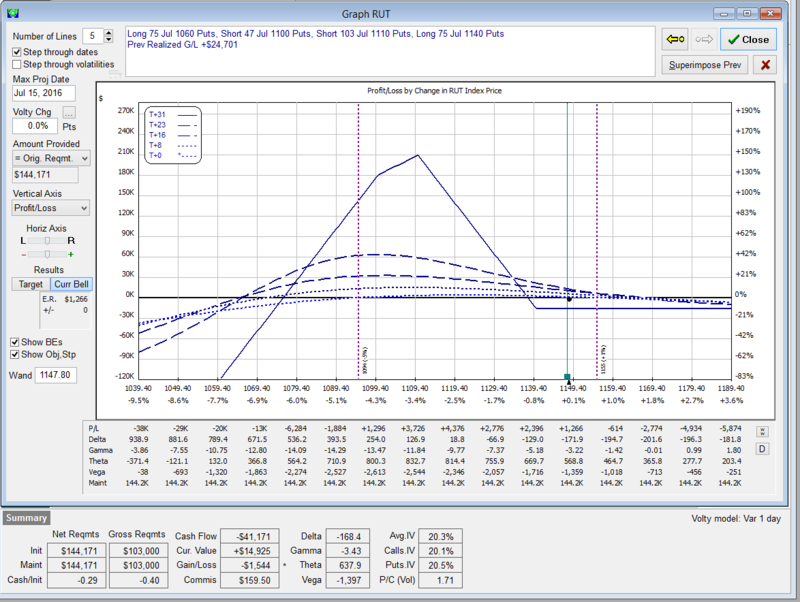 The steep option skew has made butterfly pricing very attractive these past few days. As I said yesterday, it was different and kinda unusual. 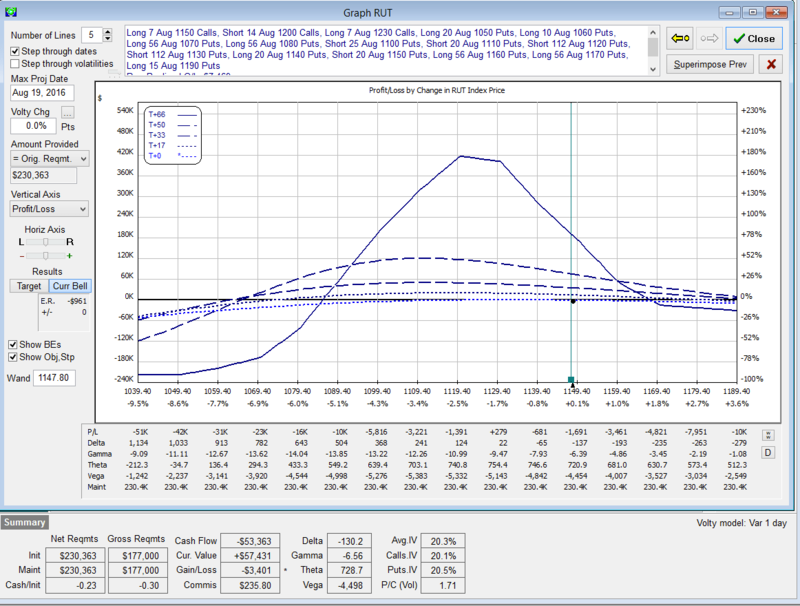 Volatility increased and usually vol skew flattens out but this time around it actually did the opposite. 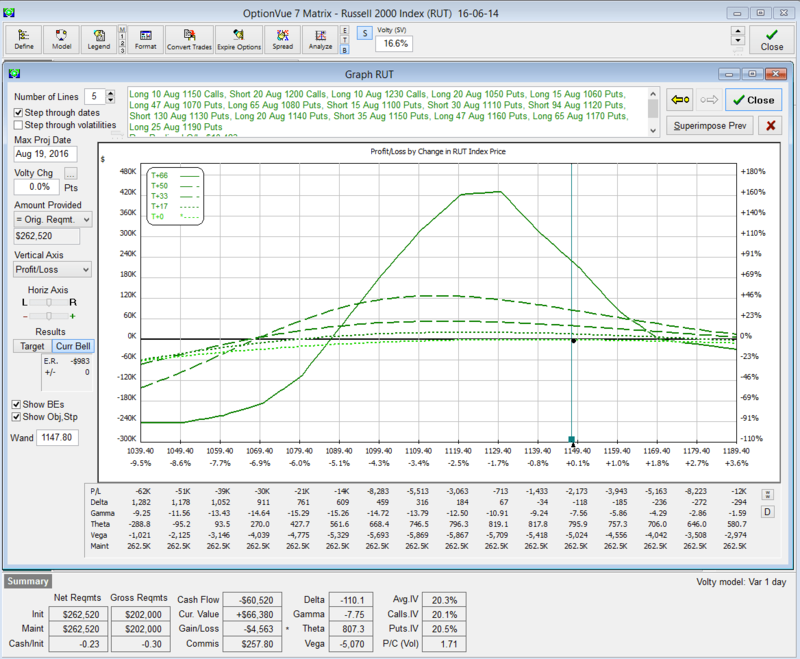 This made pricing great for entry but negatively affected BWB and BB trades already entered. My OV risk profiles were not as expected going from Thursday till today. However, it got better towards end of day. 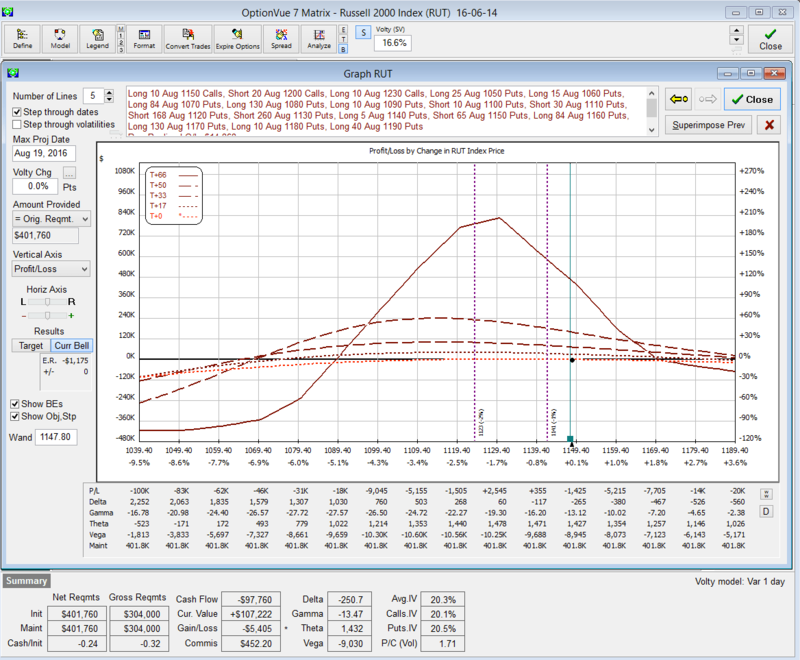 There is a lot of doom and gloom right now, we cut 2080 like butter and kept going. The selling is relatively emotional and fearful and until we have resolution in the events, we can expect some more uncertainty and volatility. The Brexit is mostly about immigration and I’d guess that on an exit, the politicians would keep the same trade agreements in place. So probably ‘much ado’ about nothing that has any real effects on the economy. My gut says we’ll have a bounce tomorrow re the Fed meeting and probably into OPEX. I might hedge with some cheap weekly calls. I don’t know yet. We’ll see how it plays out. Here are the risk profiles of the three Jul Rhinos. 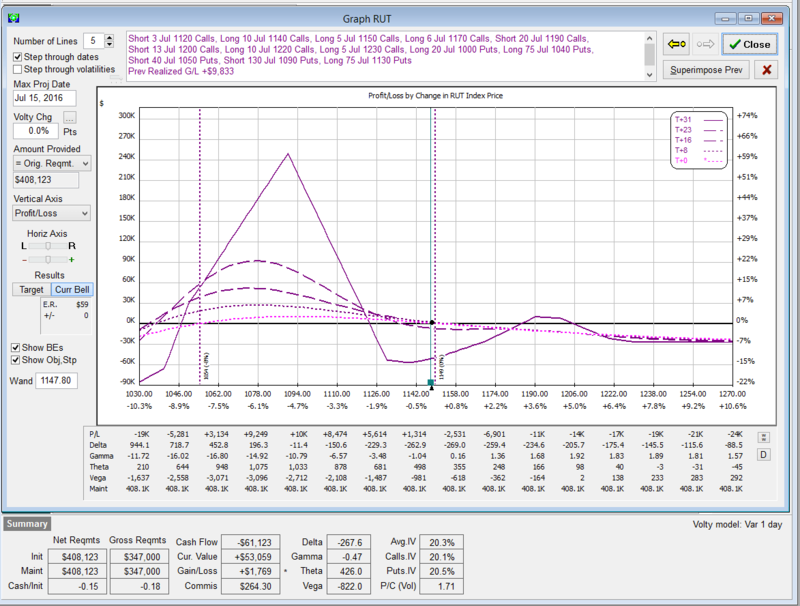 The P/L aren’t accurate as I hadn’t updated pricing on a few adjustments but the profiles are correct. Here are the other three which started off more as an Broken wing condor. 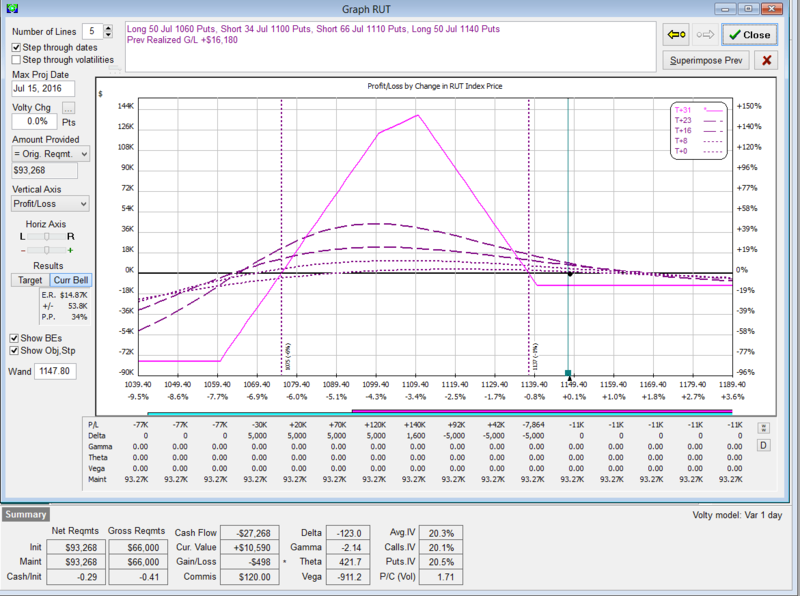 Here are August trades, which are a testament to the whole Vol skew issue. These should have had a massive P/L increase on the fall. We were outside the tent and entered in, the OV mdoel would have suggested a large increase in P/L. This will self correct. But I kinda learned something, I was or had a tendency to add Rhinos at perceived tops and I did this fairly well timed a week to two weeks ago when RUT @ 1180-1190 and I’d have expected that with heavy negative deltas and a bearish bias, that I’d not be down right now. 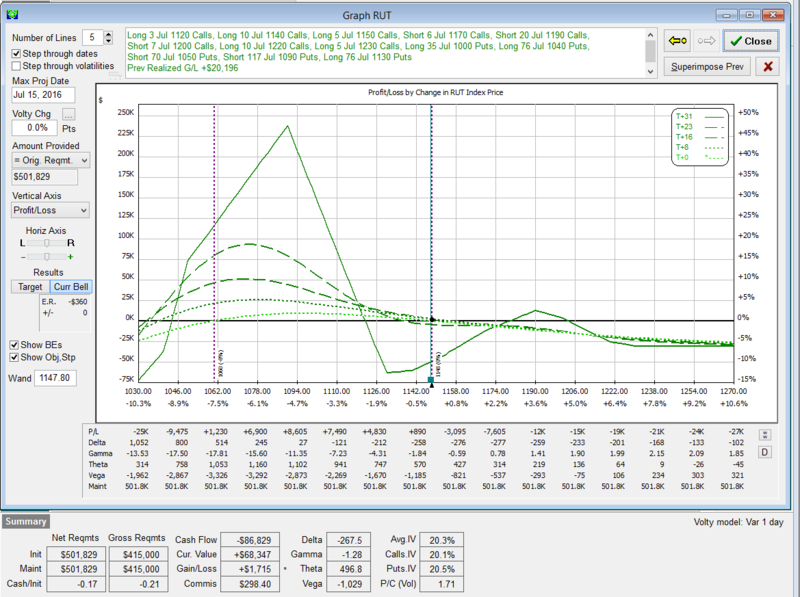 but I am, at least for now, because of Vol Skew. The pricing on the BWBs were about 3.30-3.40. Not great. 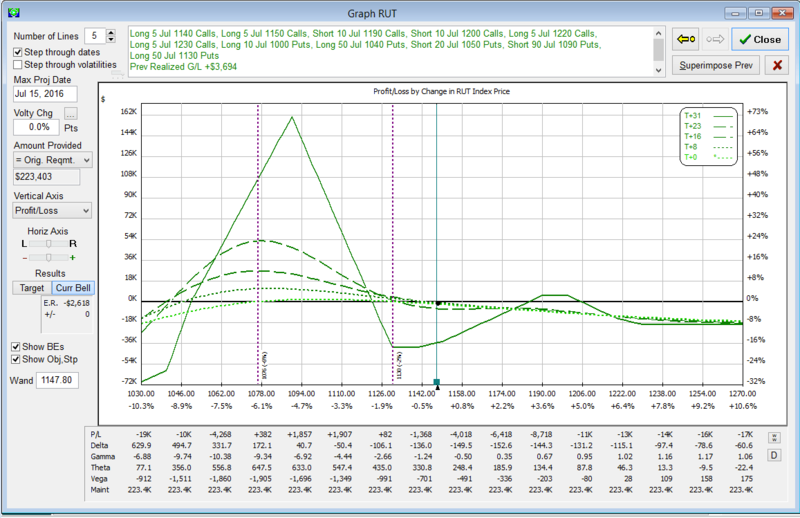 I don’t think I’ll be as excited to enter on big up moves, rather, I’ll be more excited to enter during down moves where vol pops and skew is favorable. I have a bunch of SPX ones as well but I’ll post those later. They were purchased at much better prices and are doing well. It’s been a while since I posted….I was traveling for work and had minor surgery which put me out of commission re posting. I ended up closing the June trades for a great profit about 1-2 weeks ago. I am in the July and Aug trades all of which are about break-even at the moment. They were all pretty heavy delta negative a week ago and according to OV, we should have expected some significant paper profits because of the RUT falling from 1188 to 1153, but we haven’t. Completely different position than the models suggested. I understood this and sort of expected it with any decent IV rise but not quite as pronounced as it is right now. 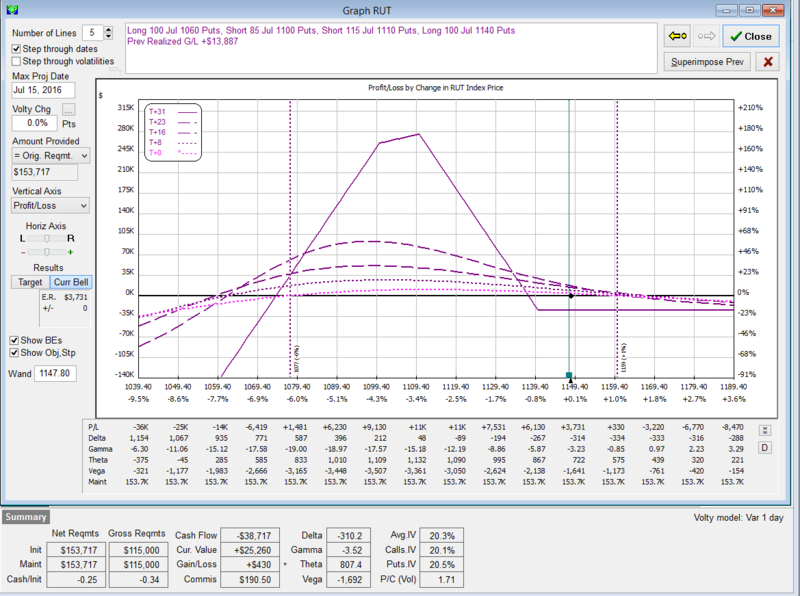 Usually, if things calm down just a little after an IV spike, the skew changes and time decay floods in and positions start to match the expected model. This time around, this won’t happen until we pass the two big events that are causing the IV spike — Brexit and the Fed meeting. The recent terror attack and the politics surrounding it also presents some issues. For now, market makers will keep pricing inflated. Not forever, since all premium must come out but at least until those events pass and there is some breathing room. Seen it before many times. For now, I am taking the opportunity to add more bearish leaning BWBs to the trades as they’re much more decently priced. I just paid 2.70 for a BWB whereas I was paying 3.40 just a week ago. So not only are they cheaper, but they’re helping hedge to the downside. Our Jul and Aug trades should be able to handle any bearish fall so long as it’s not like 10-15% overnight. They’re all good till about RUT @ 1100. The position they’re in now, ANY stabilization or drop in IV will get them to probably max profit pretty quickly. We’ve got 35 days left and lots of room to the downside and lots of theta since we’re under the tent. Should be a good month unless we have a large correction. Undetermined whats after this..maybe south of France or north Italy. Any suggestions?